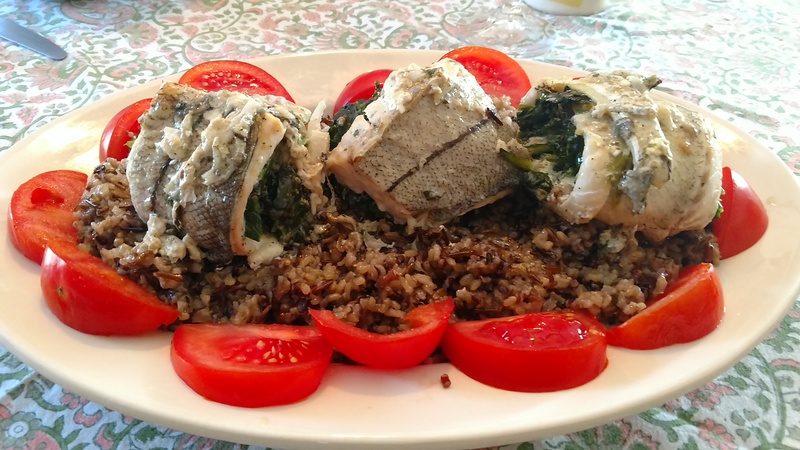 This is a relatively quick seafood dish that will wow your family or guests. 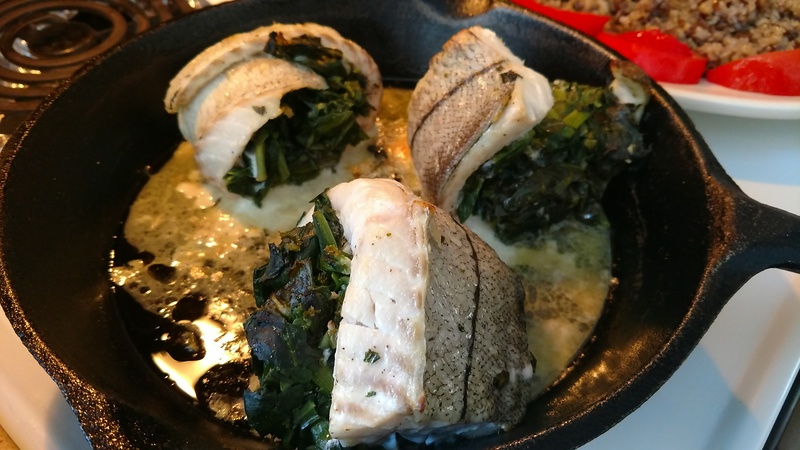 Simple: fish fillets rolled up with spinach as a stuffing. The fish can be any firm-fleshed fish fillets, cod, haddock, perch, whiting, or whatever is available in the fish aisle. Still, I can hear you say, spinach? Ugh! Hey, you don’t have to be Popeye to like spinach. Here, the veritable green is seasoned to taste with salt, pepper, and garlic; and brushed with an lemon-butter sauce. Believe me, you’re gonna love it. The recipe can be done with fresh spinach, but I happened to have frozen organic spinach on hand and, you know what, it was easier in the preparation than the fresh stuff. You can still substitute fresh spinach if it’s on hand. 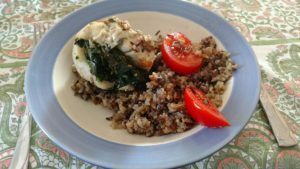 We served the dish with a wild rice mix. But regular rice, or couscous, or quinoa, or even orzo pasta can work just as well. So, whatcha waiting for? Go for it and amaze everyone at the table. You can lie and tell them it’s a complex, classical cuisine recipe that took hours to prepare just for them. Oh, yes, it goes perfect with a Riesling. I prefer the German or Alsatian Rieslings that still have a hint of sweetness. California and Australian Rieslings have a dryer flavor. 2. Wash fillets under cold running water and pat dry with paper towels. 3. Cook frozen spinach, along with garlic (following package directions), drain, and chop coarsely. 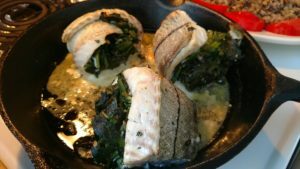 Spread fillets evenly with spinach, sprinkle with salt and pepper. Roll up like jellyrolls and place, seam side down, in a grease shallow baking pan (I prefer cast-iron). 4. In a small bowl, mix butter and lemon juice, and brush heavily over fish. Place in oven and bake 20-25 minutes or until fish flakes easily. Serve fish rolls on a a bed of wild rice or favorite grain.